Makituk Pingwartuk is an Inuit potter from Nunavut. She lived in Nelson, BC for some time in the late 1960s while she attended the Kootenay School of Art. It was in Nelson that she made friends with my wife’s family who have several of her ceramic sculptures – hence my interest in her and her work. In future posts I will feature one sculpture at a time (this link will display all of them once published). This collage shows all that we had found when I was taking these photos four years ago. Since then a small seal has turned up. There were two other small seals as well, and one of them should be around this house somewhere. In this blog I will give a bit of information about Makituk that I have been able to find out from various sources. If I learn more I will either edit this post, or add information to future posts. I prepared this and the other posts in this series in September four years ago a few weeks after I started blogging. I did not post at that time for a number of reasons. One was that my wife, though a child in Nelson, was befriended by Makituk and has been trying to find a way of getting in contact with her again. Another was that I attempted to find out more information from the Houston North Gallery and Houston family who had been selling Alma Houston’s collection of Makituk ceramics – I was assured of a response by a staff member but it never came. Also, I was hoping to interview Walter Dexter, one of Makituk’s ceramics teachers and a family friend who also lives in Victoria. He had been very ill so that chance never arose and sadly he died just a few weeks ago. This year we also tried to contact a person we think is a member of Makituk’s family, but have not yet had a response. Since these pieces will soon be out of the family’s hands and in a national public collection now seems like the time to post these words and photos. There is very little information on the internet about Makituk Pingwartuk’s work with only a handful of images of small sculptural and functional works. Many are apparently learning pieces. Most pictures are of her functional pottery; bowls, cups, vases and the like. There is next to no biographical information about her on the web. One picture of her was published in the 2005 issue of Inuktitut Magazine #95 (page 41) but the link I had 4 years ago is broken now, and the new location doesn’t seem to be the same issue. She was born in 1936, is from the community of Kingnait, more widely known in the south as Cape Dorset, in Nunavut which has been a highly important centre of Inuit art since the 1950s. Makituk Pingwartuk was initially supported in her potting by a federal government program sponsored in Cape Dorset. The ceramics program funding was cancelled after 2 years and to further her work she went to the Kootenay School of Art. There her ceramics teacher was Walter Dexter, one of Canada’s outstanding potters and head of ceramics at KSA from 1967 to 1974. She is also said to have been taught during the late 1960’s by Chizuko Shumano in Cape Dorset. The archived Houston North Gallery reference (see next paragraph for links) says that after only her first year of potting she entered a piece in the Biennale in Florence (Firenze) and won 3rd prize. 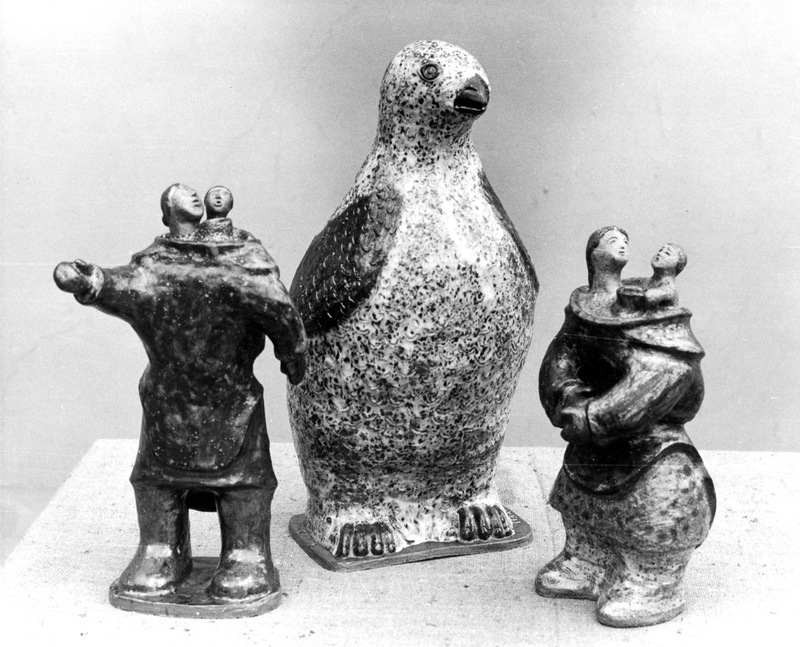 There is also reference to her being one of two Inuit ceramic artists to show in 1967 (or perhaps 1966 the sources are conflicting) at the International Exhibition of Ceramics in Faenza, Italy. Probably this is the same show, though it did not become a Biennale until a few years later and if so she had probably been potting for 6 or 7 years at that point. There is another reference that I have only seen as a truncated snippet on a google book search in North, volume 15, page 38 that reads “Makituk Pingwatuk Halfway around the world at Faenza, Italy, international recognition was given to the talents of … her enthusiastic instructors entered three of her pieces in the 1967 International Exhibition of Ceramics held in Faenza, Italy.” More light is shed on this award, and Makituk’s time in Nelson in another google book snippet from the BC Government’s Annual Report of the Public Schools Volumes 94-96, Page 91 (dated 1966 but perhaps covers three years) which reads “The Kootenay School of Art gained further recognition and awards by having all its ceramics entries accepted for exhibition at the International Exhibition in Faenza, Italy, with Lydia Makituk Pingwartuk being awarded third prize and the school receiving a silver medal for its entry.” So it seems that the pieces I am writing about from the family collection are contemporary with those that were submitted to the competition in Faenza. The source for some of the above information about Makituk appears to be the Houston North Gallery website in Nova Scotia, but the page referenced here and apparently here is no longer active. Fortunately the page was archived in 2009 and can still be viewed with a concerted effort – below I have excerpted the entire biographical text from that source which is now so hard to track down. The archived page shows a lot more of her pottery for sale at that time. The gallery currently lists a number of pots for sale, mostly bowls, cups and vases, and also 4 years ago a teapot (no longer shown) and a “representation of a teapot” as well as a “happy little animal“. The source for these names appears to be the Houston family and ultimately it is likely that is how Makituk referred to them. Below is the excerpt from the discontinued Houston North Gallery webpage. A note on spelling – John Houston uses an “o” in the last syllable of her surname, while I have used a “u” which is how her name appears in other on-line sources, though this source makes it clear there are several spellings of her first name in the Roman alphabet, her last name is most commonly spelled the same way as I am using. Her signed pieces read Makituk. “Makituk Pingwartok found her passion in ceramics, working with Japanese potter Chizuko Shumano in Cape Dorset in the late ’60s. Scarcely a year after she found out how pottery was made, her work was entered in the prestigious Biennale in Firenze (Florence, Italy) and won 3rd prize internationally. Soon after that, the program was closed down, as often happened with such pilot programs, but Makituk sent her work to us for safe keeping, with the idea that one day we would exhibit it. “During our childhood, Makituk Pingwartok was a second mother to my brother Sam and me, even coming with us when we moved to Michigan for a time. It is my pleasure to broaden the circle of people who recognize her special talent. The Inuit Artwork Database includes one of her unglazed sculptures of an Inuit person which looks as if it is the one listed for sale through the Houston North Gallery. Unfortunately the information in the database does not give its dimensions, or a precise date (the 1960’s). A different written source appears to be for the same sculpture and shows it’s size as 6.5″ x 3.5″ x 3″, which is the same information as the one on the archived gallery page. The database image (depending on your browser, you may need to search her first name, then download the .mov file and look at it in Quicktime) although small is useful because you can rotate it 360º with your mouse and it is quite clear from the finger marks on the back that this sculpture is based on a wheel-thrown pot. It is particularly interesting to me because of the striking similarity to a glazed version that is in my wife’s family, shown above, that is more than 3 times bigger. Another photograph (here) shows one of her wheel thrown bowls. There appears to be a contemporary photo of Makituk with her work in the Olea Davis collection at UBC. I will see what I can do to get my hands on a copy. EDIT: I have now obtained copies of the two photographs in the Olea Davis collection and have their kind permission to post them here. I paid for this single use of these images, and the UBC Library retains control of them so please contact them if you would like to use them. Link in previous paragraph, and in captions to images. 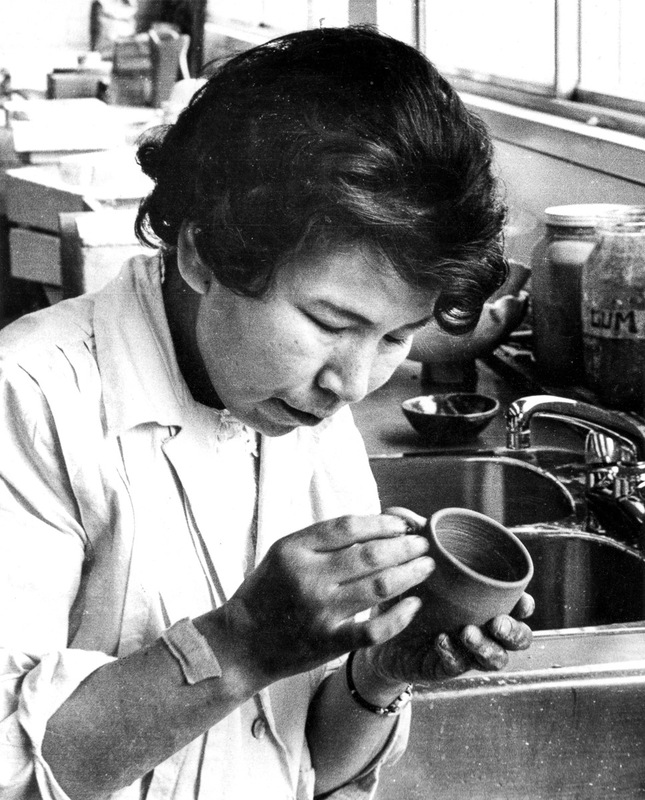 Olea Davis was the founder of the BC Potter’s Guild and her archival fonds appear to contain a lot of information about pottery in BC, including these two photos in a folder (9-14) titled “Makituk, and her work”. No other information is included with the folder and the photographer is not known. The list below is of each piece I plan to post about. As the posts are published the links will become active. The sculptures are listed from largest to smallest, but I will post in a different order. I apologise for grainy photos throughout the series – I accidentally shot at ISO 6400 before I learned how to set my camera in live view (while focusing) so it did not default to program mode when taking stills. All images in this post and series are copyrighted and may not be used without permission except by Makituk’s family members, though we would love to hear from any family that choose to contact us (contact: ehpemm_at_gmail.com). I have recently come into possession of an inuit sculpture that resemble one of your posting “man” by Makituk Pingwartuk. It is not signed or dated. I would like to send you a picture of it but I can’t seem to do it here. My website is endrefarkas.net if you want to get in touch with me and we could arrange for me to send the picture to you. hi endregfaras – my email is on my About page – second line from the bottom. I don’t believe that Makituk worked in any medium but ceramics. If your sculpture is ceramic then the likelihood of her having made it are probably quite high as there have been few Inuit ceramic artists. I don’t think it’s ceramic. A note on the bottom of it, attached by the person selling it said “red sand”. I do not know much about sculpture. I will pursue it. If you got the picture let me know. I tried sending it. If not let me know how I can send it to you. Hi, I just found the picture and emailed back. Definitely ceramic. Similar but a bit different from Makituk’s work that I have seen but could be hers. Clay body and glazes unlike pots from her Nelson years that we have, but she did use other clay bodies and glazes in other places. Good luck sorting it out! It’s a nice piece regardless of who made it. How interesting to find this artist recognized. Santo Mignosa has spoke with me about these students from Cape Dorset, and was also one of their teachers, and I believe, was instrumental in getting their work submitted to the Firenze Biennale. He remains very proud of their recognition. I am also very interested that you quoted the Western Potter….did you find it online?? Hi Debra – thanks for commenting! It is interesting to hear these connections for various people. I did find the Western Potter on-line. If you click on any of the bold words in my post, it will take you to a link for the source that it is referring to – the copy I found via a google search is in the archives of the Potters Guild of BC. However, I did grow up reading (or browsing) the Western Potter as my parents were (and still are) potters. We moved to BC in 1968 which is probably when they first started getting it. If you click on the Pottery tag at the bottom of the post, you will find other posts I have done for other potters. Once again I have updated this post, this time with an undated archival photograph of Makituk in the studio, and a photo of some of her work. I have just added some more information that I found about Makituk’s work, her time in Nelson and her competition entry in Faenza. I have again added additional information, this time also about a show in Texas that she exhibited at. Such a small world it is, I do not know Makituk but I do know members of the Pingwartuk family in Kingnait (Cape Dorset) and have visited the community a couple of times. As can be seen in Makituk’s work if there was ever a community blessed with artists it is certainly Kingnait. Hi Marcel – thank you so much for responding! I am constantly reminded of what a small world it is and this blog certainly does that from time to time. It is great that someone that knows members of Makituk’s family has seen this post. I am hoping that family members will see the wonderful art that she made and which has for so long been out of sight in a private home down south. The final process is in place for transferring these pieces to a national collection, and when that is complete I will update this post with the new provenience. Fascinating! I look forward to your future posts on this artist, and to any additional information about her that you chance to come across. Thanks vfeddema. I don’t think I will be digging too much deeper for info, but I do hope that by publishing this it will cause someone who knows more to come forward with information.